In the examples above, a living area had been illuminated by two dual-fluorescent lamps (LEFT), consuming 160 Watts of power. This produced a harsh, white light that reflected much of its output on the walls, which was quite overbearing for a living space. 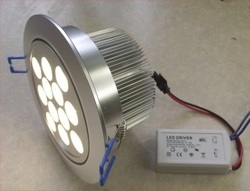 The lamps were then replaced by four LED lamps with a 90º spread (RIGHT), consuming only one quarter of the power. This produced a pleasant warm-white illumination over the seating area, much more suitable for this situation. Also, the LED lights eliminated the two seconds of the usual flickering that occurs whenever fluorescent lamps are first activated.